Discover more, accelerate breeding. Together. Join leading scientists, defining a new era in the discovery of key genes. Discover, collaborate and accelerate with CropPedia; the leading data integration, visualization & knowledge sharing tool..
Let’s take this leap together. The leading knowledge platform and database management system for fast and effective marker development and lead gene discovery. The ultimate software tool to speed up molecular breeding by easily tracking and selecting trait associated leads. In-house platform combining public and private data, visualizing and integrating public and proprietary tools, presenting accurate results faster. Work together globally and optimize the output of team efforts through the web-based gene discovery platform. Let molecular breeders team up with trait specialists and bio-informaticians. Share results in dedicated workspaces. Connect to accelerate breeding. Best crop genomics integration and knowledge discovery tool in the world . By using state of the art visualization tools, complex data is made easily accessible. Data integration allows for seamless searching and jumping from one visualization tool to the other with a single mouse click. Use workspaces to keep your discoveries private if necessary, or share them with your team to improve collaboration and optimize your workflow. Gather and save data in your workspace to get a clear overview of the trait you are working on. Fully functionally annotated genes from KeyGene’s in-house annotation pipeline, are integrated and searchable. Using more than 25 years of KeyGene experience in plant data to ensure optimal quality of data. Significantly accelerated discovery timelines. Better insight, better markers. 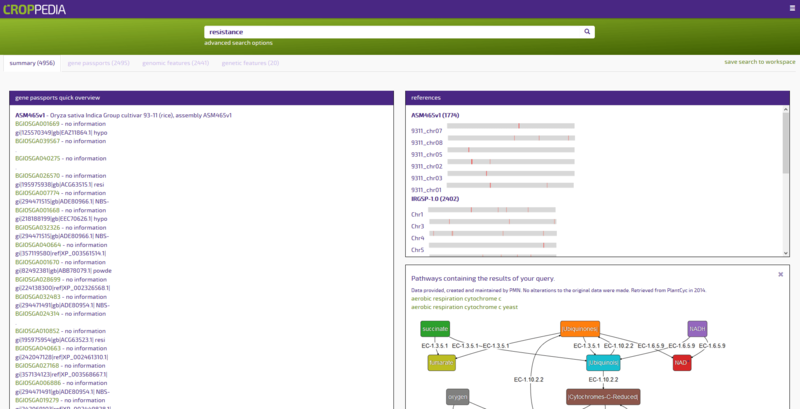 User friendly interface to access complex data for molecular biologists. Specific database management module and an Application Programming Interface for expert bioinformatics access. Compatible with in-house pipelines. Query private and public data simultaneously without the need to disclose gene information outside the company. Integrate and use datasets from multiple crop species of various origins and data types. Ready to use software with plug-and-play installation. User authentication and user groups allows for controlled access to the tools and data on your system. Monitor and manage system processes directly on the system. Search all available data sources in CropPedia. Find your candidate genes quicker through faceted filtering capabilities. Introducing gene passports; extensive functional annotation reports. 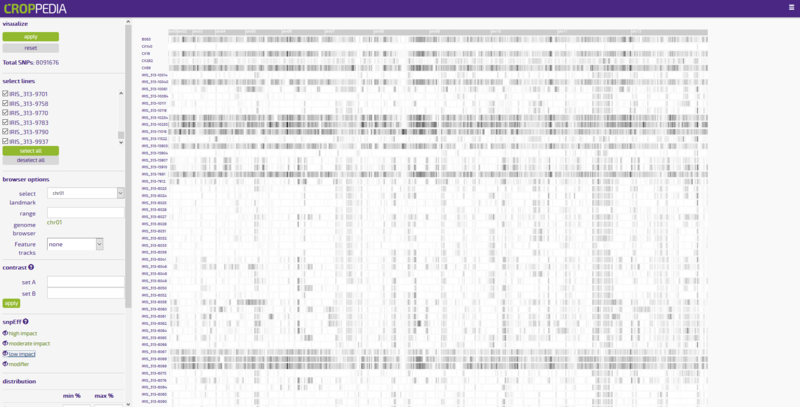 Visualize genomic regions by using the seamless integration with the JBrowse software. User-friendly configuration interface. Display and compare multiple genomic and genetic maps in one view. Pinpoint interesting regions using built-in synteny visualization. Access the search module directly from each mapped feature. Use the world’s fastest variation viewer to compare structural variation of (re)sequenced germplasm lines in complete populations and filter for interesting variation based on annotated function. Import networks created in Cytoscape and locate relevant data from all datasources in CropPedia, directly from the network visualization. 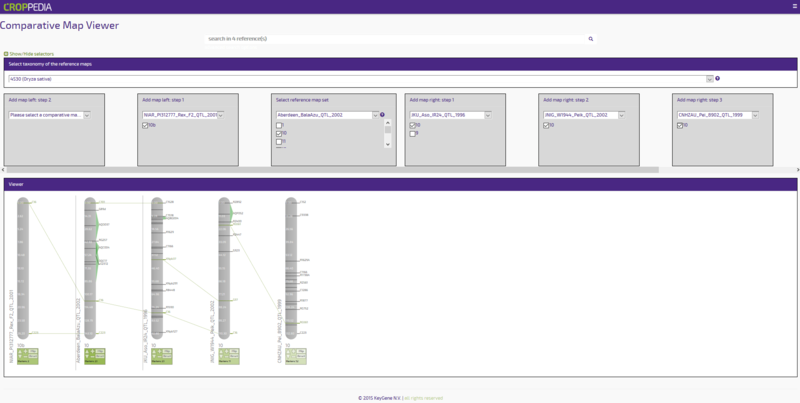 Perform a blast alignment against the genomic sequences in CropPedia, and immediately visualize the results in the genome browser. This is a response to our need for one platform which integrates and visualizes all data and knowledge. Wow, this is the tool I always dreamt of. 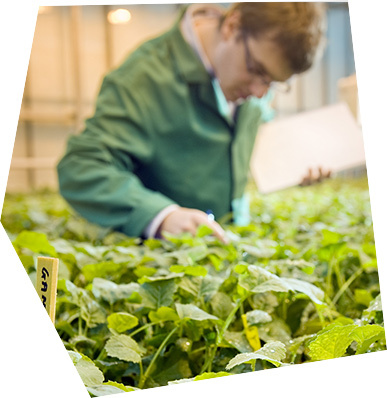 KeyGene has developed CropPedia for over 25 field crops and vegetable crops as well as plant pathogens, used on a daily basis by leading scientists worldwide. CropPedia is a great tool for data integration, visualization and knowledge sharing between research units. We use it for candidate gene discovery in all of our major vegetable crops. Great tool for knowledge sharing and perfect to speed up our molecular breeding work. CropPedia Software runs locally at your premises and is installed as two virtual machines, one for the data and one for the visualization tools. KeyGene will assist in the installation if required. A yearly license fee applies, which includes software updates, bug fixing, training and support. Additionally, yearly updated data packages can be purchased per crop. Customization of CropPedia to your individual company needs is offered at an additional development fee. Ok now it is installed, but how do I start? KeyGene gives support & on site training (workshops), webinars and demo’s. Everything you need to familiarize yourself with the tool and to use it effectively. Croppedia also has an in tool tutorial and help function. How do I share findings with co-workers? CropPedia has a built in Workspace functionality. Workspaces are an easy way to store searches and features. Share your workspace with a colleague or your project team to collaborate more efficiently. Can I integrate CropPedia with internal systems? Depending on the system you use, we can discuss ways in which to integrate CropPedia into your current infrastructure. You can upload data yourself or ask KeyGene to do this for you. KeyGene provides yearly updates to public data packages in your crop(s) of interest. How is my private data secured? CropPedia runs behind your own firewall to ensure full control on access to the data. Administrators can restrict access to specific data sets for individual users. How will the software be updated? KeyGene continuously develops novel functionalities for the CropPedia platform. As licensee you will automatically benefit from functional updates when they have been developed and tested. Start using CropPedia to get the most out of your genomic & genetic data. I represent a team of over 15 developers and internal KeyGene users of CropPedia. As part of the CropPedia development team I give demo’s, training and support. I would be happy to address any question you might have. Want to receive the CropPedia whitepaper?